John Clayton, very respected as far as I know, in his recent QB list said Super Bowl 50 put Manning past Unitas. That is just absurd in so many ways, right? It’s asking way too much for this game not to affect people’s views on the GQBOAT thing, because people are sheep. But I know you know that lol. Go Atlanta. NE 31 ATL 17 is my guess, though. I have NE winning 27-20, but don’t feel comfortable about it at all due to the Pats late game defensive fades in Super Bowls under Belichick. Brady has now played in 7 Super Bowls, and his defense has offered negative support, as measured by expected points, in 6 of them. The narrative that Brady wins in the Super Bowl because of his defense is a myth. What were the “expected points” Sunday? Less than 21? Against a historically potent offense? You’re not counting the pick six against the defense, are you? Not really. The Pats forced a key turnover, and had some key stops in this SB that helped them comeback against the Falcons. They also forced several key turnovers in Brady’s first three SB wins. Three were NFL championships in a 14-team league. The equivalent of a conference championship today. I mean, for a numbers person, this is pretty obvious, isn’t it? Expected Points is a statistic. It measures the overall contribution of a particular unit of the team, and can also be broken down by individual players. The Pro Football Reference boxscores have Expected Points data, that show that in 6 of Brady’s 7 Super Bowls, the overall contribution of the defense has been negative. That’s not my opinion, it’s a statistical fact. Make of it what you will. The idea that “one game shouldn’t change” your opinion of a player’s legacy is both utterly STUPID and contrary to very idea of a legacy. It vitiates the gravity of the playoffs, and by extension, the gravity of chamionships – which, as we all know, is WHY they play the game. Super Bowls matter. Of COURSE one game should change, and often does change, how one player’s legacy is perceived. 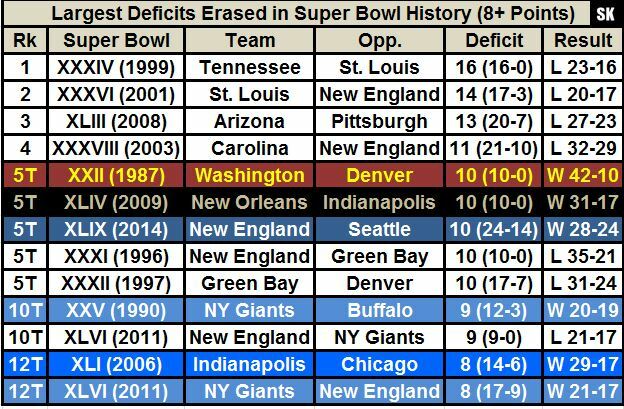 If Eli Manning somehow gets into the HOF (even though I don’t believe he is a HOF player), it will be largely on the back of two Super Bowls in which his defense played like gangbusters. The idea that one game shouldn’t change how a player’s legacy is perceived presupposes that regular season games and playoff games should be equally weighted, and that Super Bowl games shouldn’t be weighted any higher than any other game. This is patently absurd and strips the Super Bowl of any meaning at all. So legacy is reducible to stat-padding? Or is it reducible to some combination of rings/clutch performances/stats? Because your criteria of top 5 QBs is nonsensical – under what criteria is Joe Montana AND Peyton Manning ahead of Brady? He has superior playoff statistics to the latter, and superior regular season statistics to the former. 5 Super Bowls including the two greatest comeback victories ever in 2014 and 2017, highest 4th Quarter comeback % of all-time among Qbs with at least 10 attempts, success despite the vicissitudes in roster turnover as seen in the highest win % of all-time, a 5000 yard season, a 50+ td season, led the league in tds a record 4 times (including his SECOND season as a starter, for you “he was a game-manager” types), carried terrible defenses to SBs (2011 Patriots 31st in total defense), best td-int ratio ever, and guess what? Belichick without Brady: 7 Seasons without Brady, 1 (let me repeat, ONE) playoff appearance, including what many regarded as a season on the hot-seat before Brady fell in his lap (5-11 with Bledsoe, then 0-2 in 2000/2001 season). The 3-1 record Belichick had this past season could easily have been 2-2 if Arizona don’t miss a relatively easy FG (a point you should factor in since you’re so cognizant of variance and ‘context’). Belichick is a GREAT coach, no doubt; but you seem to fall prey to the hackneyed cult-of-personality hero worship of Belichick when the fact is there is more statistical proof of Bradys greatness than there is of Belichick’s greatness. And this doesn’t even touch upon the fact that Brady’s coachability is what allows Belichick to set such a hard line for the rest of his team. Lastly, Brady’s defenses have given upon ~26ppg in his 7 (7!) Super Bowl appearances, if I’m not mistaken, which in the context of this past season would rank ~25th in the NFL. The idea his defenses carry him to rings is a myth. And if you count how many top 10 offenses Brady has captained vis-a-vis top 10 defenses, you’ll find that argument to be a moot point. Brady has routinely done MORE with less (please don’t tell me Troy Brown, David Givens, Patton, Christian Fauria, Aaron Dobson, Reche Caldwell, Kembrell Thompkins, etc. were “underrated”) than any other HOF-caliber QB in history. Brady is the GOAT. Any argument against him, at this point, must erode the value of Championships so vociferously that it is effectively self-defeating. The Super Bowl wins mean more for teams than they do individuals. NE’s success has been the result of team success, and Tom Brady benefits from that. They didn’t come back against Atlanta just because of Brady. The defense had a big hand in that success. Also, they had a big hand in winning his first three Super Bowls. Brady has never really carried that team anywhere. The reason why you think he is the GOAT is because you are brainwashed by the media, and believe all the “QB driven league” crap that they try to put out there.